Stanza Interior Design create bespoke living spaces which deliver a cohesive combination of practical solutions with beautiful design. A collection of completed projects from full refurbishments to loft extensions, living rooms and bathrooms. We specialise in kitchen design - the focal point of every family home. Images reflecting different styles and designs. Recently added to our portfolio is a collection of bespoke joinery items, wardrobes and vanity units designed by Stanza, made in Europe and the UK. Our client decided to update the kitchen of their new home. The existing units were repainted and a new marble worktop, splash back and shelves added to create a fresh, almost new kitchen. On the opposing wall we designed the bespoke joinery unit for further storage, a bar and a neat desk area hidden behind pocket doors. 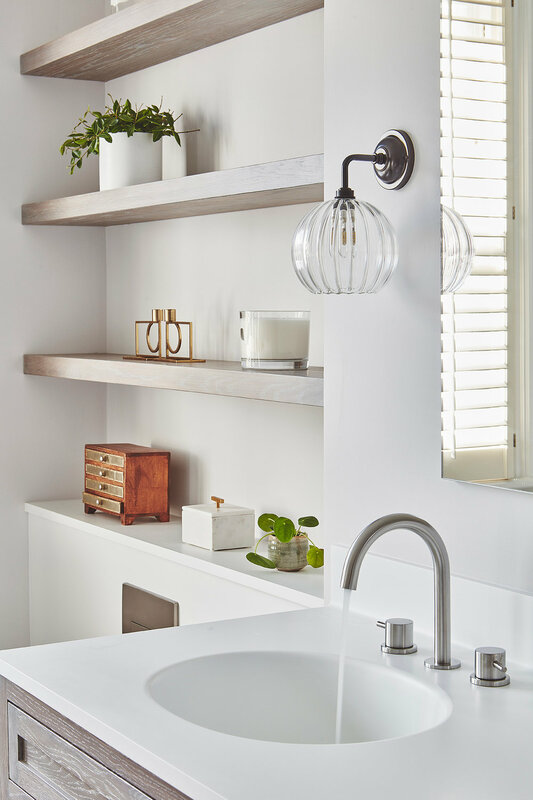 The utility room was redesigned to provide the extensive storage required by the client, creating a much more functional space than they previously had. The brief for the project was to redecorate and furnish a large family home which had been untouched for several years. The clients wanted to revamp the existing kitchen, with the view to replace it a few years down the line, decorate all the bedrooms, living room, playroom and create a new master en suite bathroom. A beautiful, traditional wallpaper and walnut parquet flooring has restored the grandeur of the entrance hall. 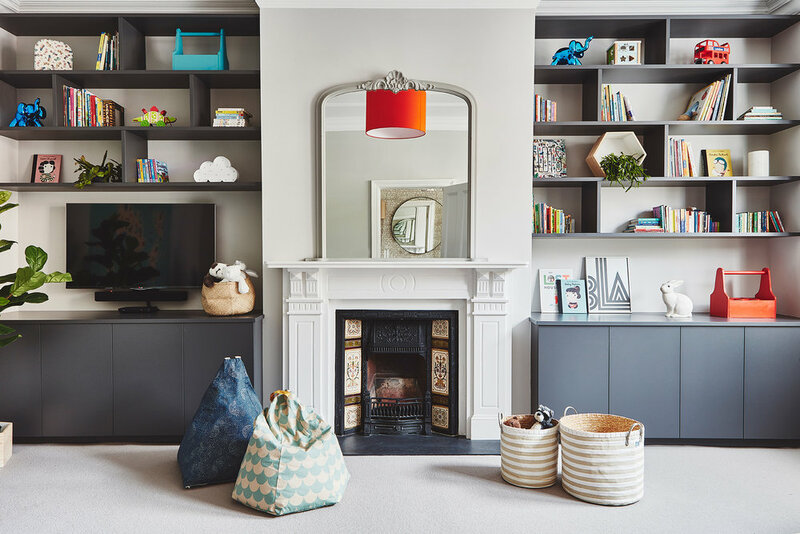 We commissioned bespoke joinery in the sitting room to create a bar area and in the playroom to provide extensive toy storage and bookshelves. 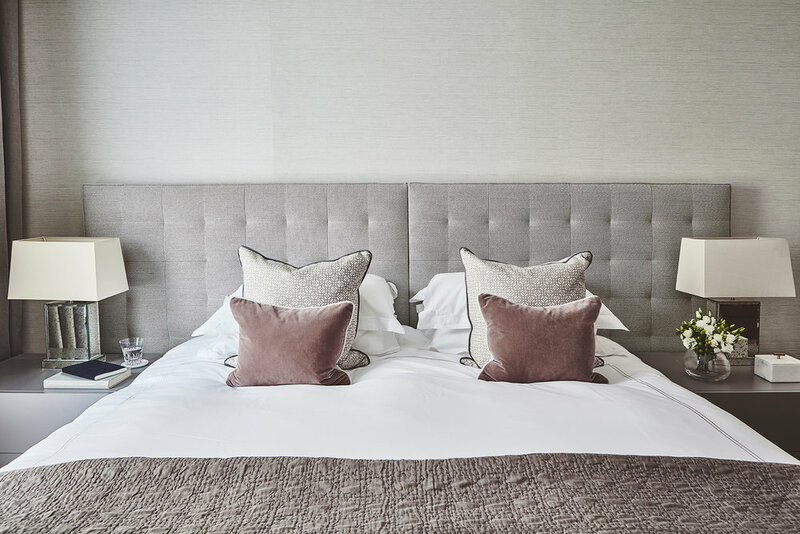 The brief for the project was to fully furnish a new build high specification apartment for clients who live out of town to create a luxurious living space for weekends and holidays. 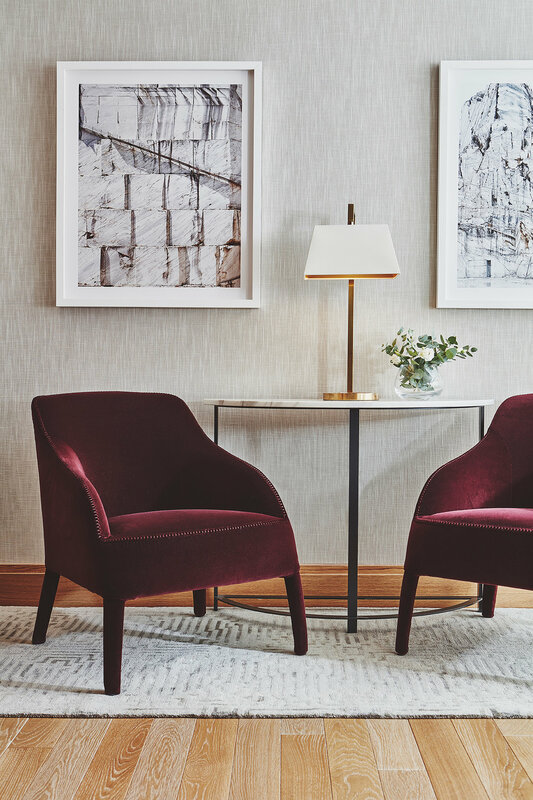 A combination of furniture by Minotti, Poliform and Ligne Roset, along with bespoke pieces by Tom Faulkner, and rich fabrics and soft furnishings give the once blank space a luxury hotel feel. 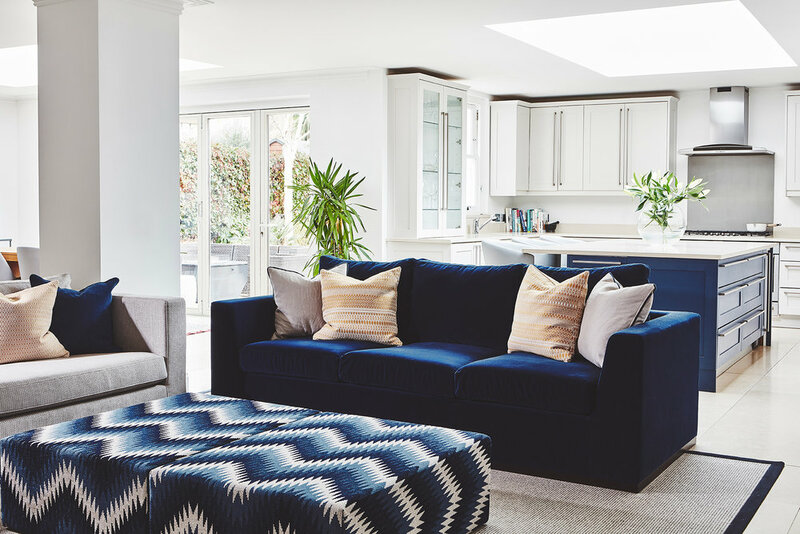 Having been neglected for many years, the clients decided to completely gut their 1930's terrace house and create a clean, contemporary family home. Few original features remained so the house was opened up on the ground floor creating a huge family kitchen separated from the more formal front sitting room by floor to ceiling pocket doors. 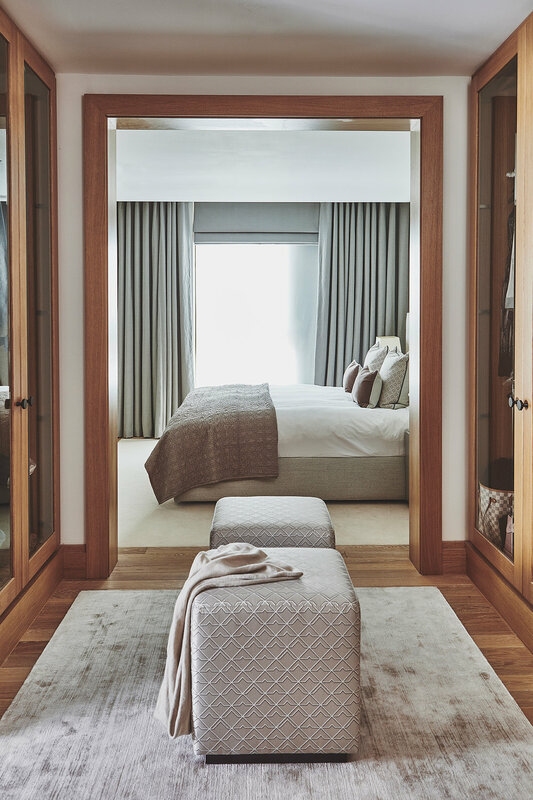 The master suite takes over the top floor of the house with a dressing room and bathroom behind a half height wall and a freestanding bath looking out to the garden. The client brief was to renovate the huge ground floor of a period property to create a contemporary family home. The back of the house was opened up creating a family kitchen, dining area and spacious TV snug with the more formal sitting room at the front of the house. The kitchen design incorporates a clever hidden breakfast unit, larder cupboard and large peninsula. An oriel window, skylights over the kitchen and ultra slim framed sliding doors create a beautifully light, open space. This Victorian semi-detached house was completely renovated and extended. The clients wanted a big, open planned kitchen diner. The bold black units and arabescato marble worktop and shelf, with no wall units, give the space a fresh, contemporary feel. The floor is a poured microcrete surface to give the effect of polished concrete. Existing clients had recently moved into a newly renovated terrace house by London based architects Minale & Mann. We brought together the furnishings we had designed for their previous home with newly sourced furniture to compliment the beautifully designed new house. We commissioned several bespoke pieces including marble side tables, the desk and bookshelves in the study. We were asked by the clients to design a new kitchen extension to create a bright, practical and sociable kitchen/family room. We worked alongside Quad Architects to design a space which would achieve the optimum layout for the footprint of the ground floor. The bespoke kitchen was designed by Stanza and made by Create Bespoke Beauty. Having lived in the property for many years the clients had considered moving area but eventually decided to restore their existing property and stay in up and coming Tooting Bec. The new master suite in the loft and the open plan kitchen/living/dining area on the ground floor mean that the clients now have a beautiful, calm, clean living space for their family and friends. Having decided against replacing their solid wood kitchen, the clients brief to us was to revamp the kitchen and ground floor of a Victorian terraced house. The kitchen cabinets were painted, worktops replaced and a new tiled floor laid throughout. The redecoration and new furnishings have created a fresh, modern space without having to undertake any building works or kitchen replacement. The client brief was to refurbish a dark basement flat on a tight budget to create a light, clean space for resale. The kitchen and bathroom were updated with white walls, units and marble. Bespoke wardrobes were fitted for maximum storage in both bedrooms. We also commissioned bespoke marble coffee and side tables. 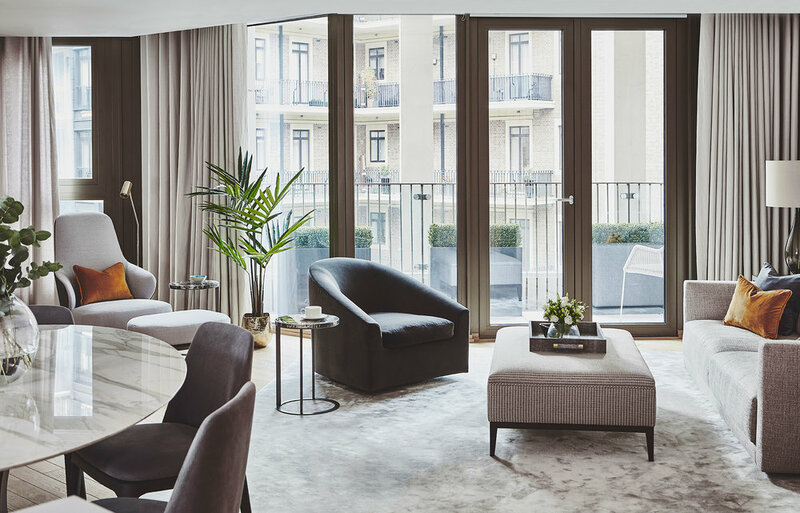 After completing projects for the client in Notting Hill and Queensway the brief was to transform a recently acquired duplex apartment overlooking Kensington into an impressive, light filled open plan living space. For this project we wanted to create a more industrial feel which the beautiful Schiffini kitchen reflects perfectly. 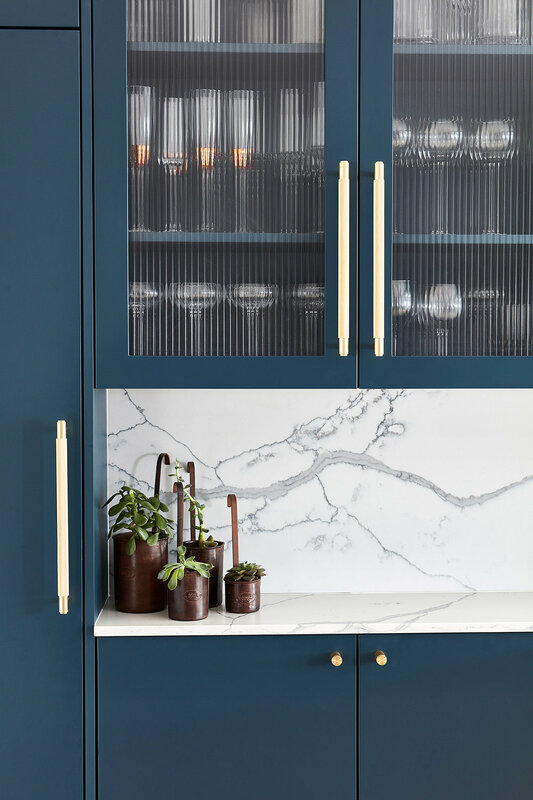 In collaboration with stylist Kerry Creasey, the brief for this project was to create an exceptional high spec kitchen in a Victorian mansion flat. The combination of striking marble with the bespoke Italian kitchen have resulted in a stunning space. We also designed and created a bespoke Italian wardrobe system for the master bedroom. The client briefed us to design and refurbish the sitting room of their period home. This included beautiful bespoke joinery throughout and the reinstating of a Chesney's limestone fireplace. The client brief was to maximise space in a small scale period property. To achieve this we extended into the side return to create a contemporary kitchen/dining space and designed a master suite in the loft conversion comprising of an en suite bathroom/dressing room with bespoke fitted wardrobes. The client required the complete renovation of an existing rear extension. The brief for the project was to create a kitchen which was both modern and traditional in style, but with with high spec modern finishes and functionality. The works consisted of the design and fitting of the kitchen, bifold doors and tiling throughout the ground floor leading out to the patio. The client asked us to design and refurbish their sitting room to create a space which was both beautiful and functional. We used bespoke joinery to create bookcases, a tv unit and log store and reinstated a Chesney's limestone fireplace. Contemporary furnishings and stunning bespoke Deidre Dyson rugs finish the space. This project was carried out in collaboration with Interior Designer Kathryn Miller, of Melissa + Miller. The spacious ground floor was reconfigured to create a wonderfully large and light open plan kitchen/living/dining space for the client. The clients purchased the property in the Umbrian Hills as a ruin in the late 80's and have spent the last 28 years working with Italian geometras and local builders to restore it. The vision was to bring together the rustic original features of the villa balanced with a contemporary aesthetic. A Schiffini 'Mesa' kitchen works beautifully under the vaulted ceiling of the old cow shed. The stonework, inside and out, has been lovingly restored. The attention to detail combined with an eclectic mix of furniture, lighting and artwork, both old and new, has resulted in a stunning family villa.